This story is part of The Montana Gap project, produced in partnership with the Solutions Journalism Network. It first appeared in the Bozeman Daily Chronicle. In central Montana, a trail of headlights pass the airport each weeknight a bit after 5 p.m. They’re making their way to one of Belgrade’s newest subdivisions. With each mile, their backdrop — the shadowy outline of the Bridgers — grows slightly. In the Ryen Glenn subdivision there are quarter-acre lots, front porches for sitting, toys in yards and neighbors who wave. People who live there describe it as a sanctuary for those who want the picket fence with room for the dog to run and the kids to learn to throw a football. In contrast, a dozen miles down the road Bozeman focuses on infill — neighborhoods with alleys in the back and homes close together — and changing expectations from the quintessential starter home to a townhouse or apartment. Her husband, Blake Christensen, said that’s intentional. “For the whole community of Belgrade, we’re creating a community by design instead of default,” he said. As more people show up in the Gallatin Valley, it’s changed the makeup of the small western towns with histories around ranching and farming. But for Belgrade, a place built as a rail pitstop, its newest locals and leaders say the population growth means the city has the chance to define itself however it wants. “We’ll continue to grow and the borders between Bozeman and Belgrade will continue to get closer,” he said. Belgrade has a few things in common with its neighbors. For starters, locals often connect to the community through the school system. That makes sense for two reasons: School events create shared experiences, and leaders said there are more than 20,000 people in the school district while they estimate Belgrade’s population is a shade above 8,500. “The community doesn’t start and stop at our city limit lines,” said City Manager Ted Barkley, citing the school numbers and listing the old and new subdivisions encircling the city. 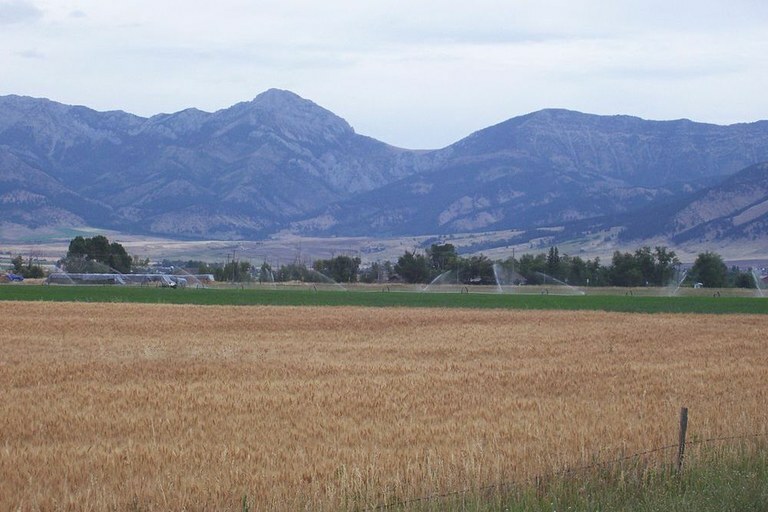 The difference between Belgrade and other Montana towns like Three Forks, Manhattan and Livingston is that its past has always been somewhat tied to Bozeman. The Bridger Mountains just outside of Belgrade, Montana. Despite the investors’ doubt, by 1886 more than half the grain raised in the valley came through Belgrade. Two years later, the warehouses were so full of grain the town didn’t have a place to hold its annual ball. While it was all built “on a hunch and a prayer,” in Barkley’s words, by 1888 Belgrade was the largest shipper of grain between Seattle and Minneapolis. He said the city’s proximity to Bozeman from its genesis means it skipped a few steps, like having a downtown with a presence that matched its community. And the storefronts that did exist didn’t always stick around when Interstate 90’s creation made it easier for the town to rely on Bozeman shops. People in city hall are also quick to point out Belgrade is the largest city in Montana “by far” that’s not a county seat — meaning none of the historic power, buildings or business that come attached to a courthouse and jail. While Bozeman’s population is nearing the 50,000-person threshold that will classify it as a metropolitan city, Belgrade is watching its population count tilt toward 10,000, a mark that will bring with it its own set of standards and expectations. Moreover, the local school district has grown to the point where Belgrade High will soon be classified in Class AA. All the growth means Karp’s office is working hard to keep up. This spring the city is scheduled to release master plans for its water, sewer and transportation systems. The planning department also has updating its growth policy on its 2018 to-do list. In addition, the city recently approved hiring a consultant to see whether it would be better for Belgrade to create its own fire department — a Montana requirement of that 10,000 population mark — or try to convince state lawmakers to let Belgrade join an existing fire district. Simply put, a lot’s happening in the city. Karp said it’s no longer just about finding less expensive housing compared to what’s in Bozeman. When lots went for sale in Ryen Glenn roughly 18 months ago, many were going for $45,000. Today, they’re selling for upwards of $100,000. To Bozeman, a slowing tide? Eve Parrow is about as involved as they come in Belgrade. In addition to her day job as a real estate broker, Parrow serves as the vice president of the board for the Chamber of Commerce, as well as on the Chamber’s Economic Development Committee. In Parrow’s eyes, the residential side of things will likely take care of itself. Instead, the focus — from a city perspective at least — should be on commercial development, which not only contributes more to the tax base but also represents a critical component of any self-sustaining, independent community. Late last year, in the city’s effort to reanimate a downtown that it described as “dilapidat(ed),” “defective” and “unsafe,” Belgrade leaders finalized a special tax district blanketing much of Main Street and the surrounding blocks. In theory, the district will raise money earmarked for infrastructure improvements, as well as business recruitment and retention efforts. Historically these tax-based renewal strategies have achieved mixed results (one such district in Bozeman raised just $167 over four years), but Parrow is optimistic. “It’s going to really help develop the infrastructure like curbs, gutters and sidewalks,” she said, which will, in turn, make it a more attractive place for locals, visitors and prospective businesses. That’s not to say the area is economically unhealthy. There are a pair of large employers in construction giant Knife River and biotechnology company Xtant Medical. There are also contributors such as the school system and smaller private employers (Albertsons and Town & Country) that represent the bedrock of any diverse business landscape. Then there’s the consistent bump provided by the nearby and ever-expanding airport, as well as planned commercial projects like the Yellowstone Airport Plaza, which, while controversial, many see as a future economic anchor. There are, however, some missing pieces, and Parrow hears two refrains echoed constantly: Where can I go for a burger and a beer? And where do I shop for a pair of socks? “It’s a couple of those key ingredients that keep people here that we don’t really have,” she said. The numbers bear this out. Since 2012, Belgrade added 25,000 square feet of retail and commercial space. That’s less than half that of the Four Corners area and a fraction of the nearly 225,000 square feet Bozeman built over the same period. The comparisons run similar for office space. Of the some 350 businesses in Belgrade city limits, 41 are food- or accommodation-related. In search of some wriggle room in an industry with vice-tight profit margins, restaurateurs often choose to set up shop in Bozeman, which, with its high visitor numbers and booming downtown, represents less of a gamble, rather than Belgrade. But there’s hope now that the outgoing tide might be slowing. For one, a recent change in liquor license laws will ensure that at least a few licenses remain in Belgrade (in the past, many of these licenses were sold to Bozeman owners with deeper pockets than their Belgrade counterparts). Alcohol sales can often spell the difference between life or death for a restaurant, and the new rule ensures that at least a few more eateries will get a shot at survival. There’s a sense, though, that the scale is beginning to tip in the opposite direction and that Bozeman is beginning to outprice new business owners, funneling them toward the less expensive neighbor to the west. Joe Dahinden, who helped run what was then Valley Bank in downtown Belgrade for nearly two decades, describes the relationship between the two cities as reciprocal. Like many, he believes attempting to make Belgrade a completely self-supported place would be fighting a losing battle. “There’s a sector of the population that’s truly a bedroom community; they are there strictly for economics,” he said. But come out to the Festival of Lights, the Fall Festival Parade or nearly any school sporting event and it’s clear that the vast majority are invested not just economically but emotionally, too. “There’s a real sense of pride and community,” Dahinden said. And while the sock shops and burger joints might be slow to appear, the city has added a healthy smattering of industrial industry. Belgrade tops the county-wide ranks in terms of industrial construction, adding nearly 1 million square feet of warehouse-style space since 2000, five times Bozeman’s amount. Historically speaking, Belgrade’s industrial growth is well in keeping with the city’s roots — the first building constructed in town after the railroad tracks was a large warehouse to store grain. This growth, however, has not been enough to stem the steady stream of residents who, as Barkley described, double dip, living in Belgrade and working in Bozeman. More than two-thirds of Belgrade residents commute 15 minutes or more to work. The motivation, perhaps, is a story of quantity and choice: For every 10 jobs created in Gallatin County, eight are located in Bozeman. Tiffany Maierle describes Belgrade, her home of 12 years, as a place where people are trying to “build it back up again.” Maierle owns rentals in Bozeman and is grateful for its proximity, but she lives in Belgrade because of the people and the slower pace. And she wants others to understand that. She said it is a challenge for the longtime locals and new Belgrade residents to create an image of Belgrade that matches up. But cohesion is happening, albeit slowly. The neighbors at Ryan Glenn like to describe Belgrade as “in transition,” “in flux” or, despite its 130-year history, “in its infancy.” The shuffle of little sock-covered feet running back and forth echoes in the background in the Christensens’ home as their sons, 4 and 7, play in the basement. Though it was a weeknight, neighbors gathered around plates of crackers and fruit on the kitchen island that Liesel kept stocked. The neighboring Doyles, whose kids are grown and out of the house, saved for years through a handyman side job before they picked their spot in Ryan Glenn in 2016. Jim Doyle was raised in Belgrade through the ’70s and ’80s. He used to ride a dirt bike through the fields — the same ones now under development — to a friend’s trailer that stood alone on the land. The families in the room all work in Bozeman. But they want the hair salons in Belgrade, the local coffee shops and restaurants. They also want the annual community events that result in crowds of familiar faces.